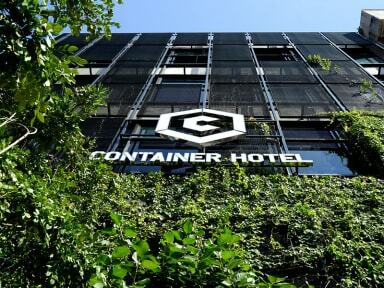 Container Hotel Ipoh have a cancellation policy of no refund of the booking deposit or total amount paid in event of any cancellation, no show or reduction in numbers. Deposit will be collected upon confirmation and remainder of amount due to be collected 1 week prior to group arrival. Container Hotel Ipoh transforms heritage building into stylish & modern capsules with smart design; offers urban travellers unique lodging experience as they embark on a cultural and culinary adventure. The design of Container Hotel Ipoh is inspired by the golden era of Ipoh, known historically for tin-mining activities in the 1920s to 1930s. The design draws the inspiration from industrial retro style, transforming the heritage building into compact modernised capsules by infusing smart design in the use of space, and functional elements to create a unique lodging experience for the adventurers as they explore the charm of the city. Really unique container hostel. The aesthetic was really cool and the rooms were well laid out. Location is right in the middle of town within walking distance of all the sights. The beds had plenty of room along with power outlets in each. Definitely a good place to stay while in Ipoh! The only downside is the hostel is not very social as there isn't a common area. Overall a good place to stay. I can't see why other reviewers complained about a lack in cleanliness. During my stay everything was very clean. The only down is that the hostel is very noisy (due to the all-metal construction). Loved the 2 pillows and the fluffy blanket. Could do with a foos ball table or a cafeteria area so that people would mingle but overall well-worth it. Very nice location, friendly staff, not bad. Overall it is an okay backpacker experience. There is a guy who misplaced his watch in the shower, I was amazed that the counter actually showed him the CCTV from outside the shower, to try to help him retrieve his watch. The dude did not manage to retreive his watch in the end if im not mistaken. If anyone might know it can inform. 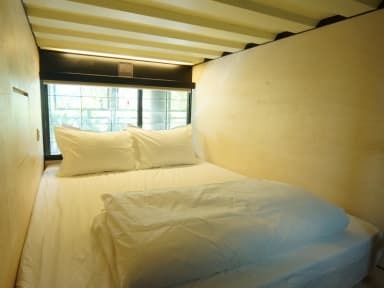 Howver, I will wish if the price could be slightly lower as it is a bit overprice for backpacker hotel. The design of this place is good, if that's what you're coming for youll be pleased. We did have problems though. There was never any loo roll available, could do with leaving an extra roll when bathrooms are cleaned. The bin in our room wasn't emptied in 3 days, by the time we left it was overflowing. The wifi was shocking, completely unusable - I couldn't even book our next hostel. The room seemed full of people who aren't used to hostel life, loud till late and inconsiderate of room mates! Really nice beds which is the main thing. Not enough storage for 2 people in the double beds meaning having to sleep with your small day pack. Very noisy in the dorms as they have blinds not curtains for each pod. Also we had a baby in our double dorm. Staff are polite but not really engaging.Low lighting in the bathrooms means they are very dim so it's hard to actually see, only 3 male toilets/shower rooms for many guests. Should be fun and cool as it has a slide but is too clinical. We stayed here for 3 nights we were charged a different price for the double pod on the third night with no explanation and they charged us tourism tax when we arrived even though it says taxes included in price online. The guests here were rude shouting at 6am in the dorm and speaking on the phone. Young children are allowed to stay in the same dorms too which can be loud. Also the lockers have a terrible alarm that goes off constantly throughout the night. Bed comfy but would not recommend. The hostel is under a new management and they do not honor bookings from hostel world. So I have to pay extra for walk in rate. It looked like I was the only guest in the entire hostel on a Friday night. There was no hot water in the showers. Cleanliness is poor, toilets smell of urine. But they did turn on 2 powerful airconds in a large form just for me alone.